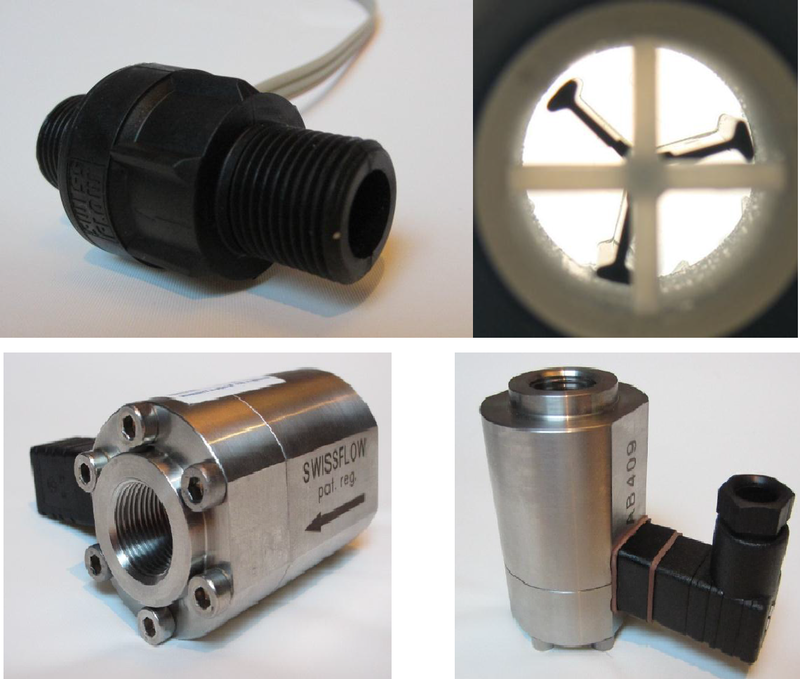 Patented technology and well thought out design are the basis for quality Swissflow turbine flow meters. The geometry of the rotor housing (vertical turbine, axial flow in) in combination with the light-weight Vectra rotor (0.04 grams) results in the rotor floating in the liquid, which all combine to create several significant benefits. With a floating rotor there is virtually frictionless wear and tear providing for exceptionally long life; a highly proportional, linear, and accurate signal; and no restrictions on mounting orientation. For a signal that is highly accurate and immune to external influences (such as from magnetism) an integrated PCB emits an infrared signal, that as it is interrupted by the three blades of the rotor provides a highly accurate translation from this physical occurrence to an extremely high resolution pulse signal. The material of construction used for the wetted materials (PVDF and Vectra) are temperature durable and highly chemically resistant plastics, making it immune to limescale build up and adding to the longevity and versatility of the design. The compact nature and threaded ports (to allow varying plumbing connection options) furthers the versatility of the design. Along with this intelligent design, the limited number of parts results in a product with a huge number of application possibilities and an excellent price-performance ratio.